Are you a fan of Corpse Bride, The Nightmare Before Christmas or Paranorman? Want to know how it’s done? Learn the techniques of stop motion animation in a fun creative environment with award winning animator Alex Machin. 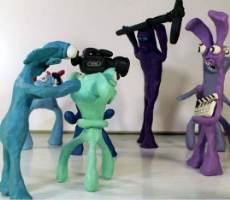 In our one day course, you will write a short story with a group, create characters, sets and props using plasticine and other materials, and then bring it all to life frame by frame. At the end of our one day course you will take home your creations plus a DVD of your short film. Alex Machin has taught hundreds of kids the art of stop motion and has produced more than 100 short films with kids as well as producing his own award winning animations, music videos and short films. This workshop is suitable for children aged 9 to 14.